I hope your year is off to a good start. I haven’t made any big resolutions because they always end up making me feel bad about myself when I break them. Instead, I’m focusing on being kind to my body by feeding it delicious, wholesome food, walking my dogs and trying to practice more yoga. I came across this Facebook post from Dr. Christiane Northrup that I want to share with you because I think it’s exactly what we need to believe and put in to practice! This is a happy little salad to brighten your winter day. 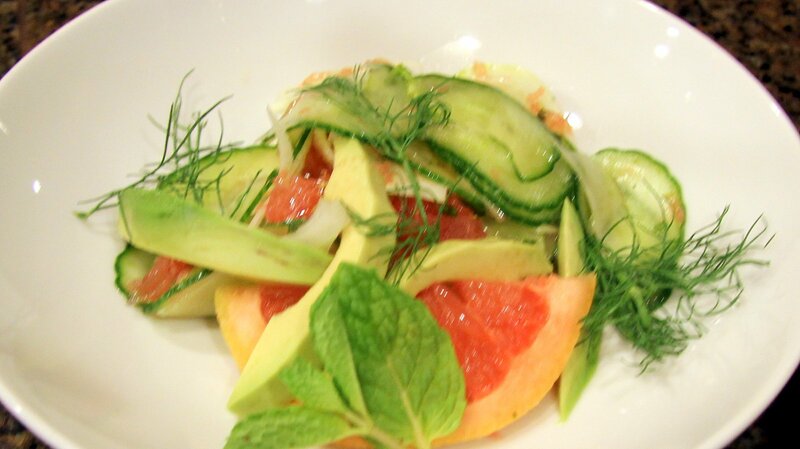 The distinct flavors of fennel, grapefruit, ginger and mint work really well together, the avocado adds creamy texture, and the cool cucumber calms all those strong personalities down. It’s pretty too, don’t you think? For a complete meal, serve alongside chicken or fish, salmon would be especially nice, or over a bed of quinoa to keep it vegan. 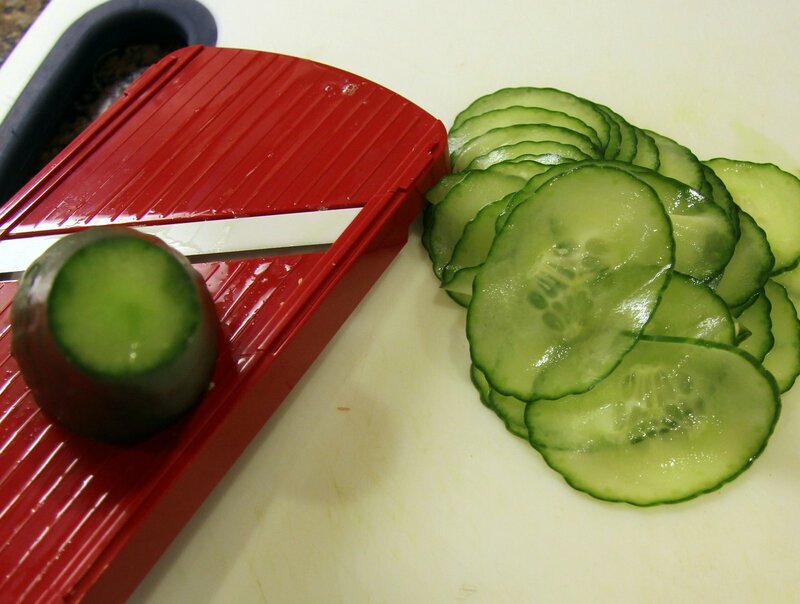 If you haven’t yet invested in a mandoline slicer I highly suggest it. I have no use for most kitchen gadgets designed to make things “easier”. The garlic press, avocado slicer and pineapple corer come to mind. The time it takes to find the gadget and clean the gadget, not to mention the space the gadget takes up in one of my kitchen drawers, make it far too much trouble for me when I can simply grab my chef’s knife. 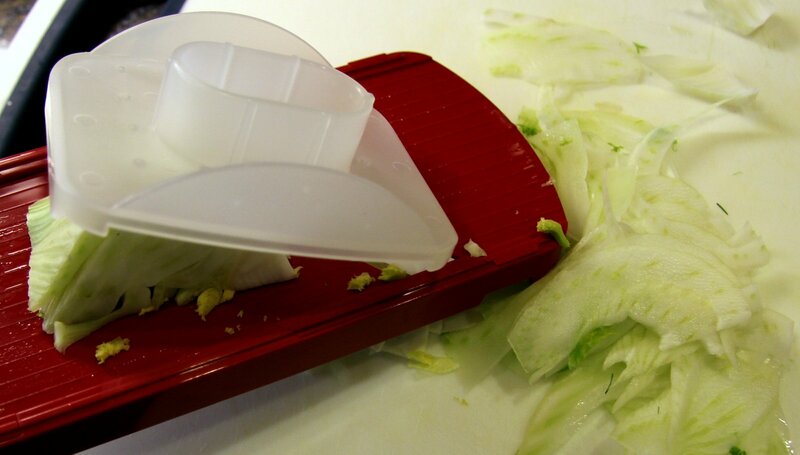 I cannot, however, produce paper thin slices with my chef’s knife so I find space in my drawer for a mandoline. 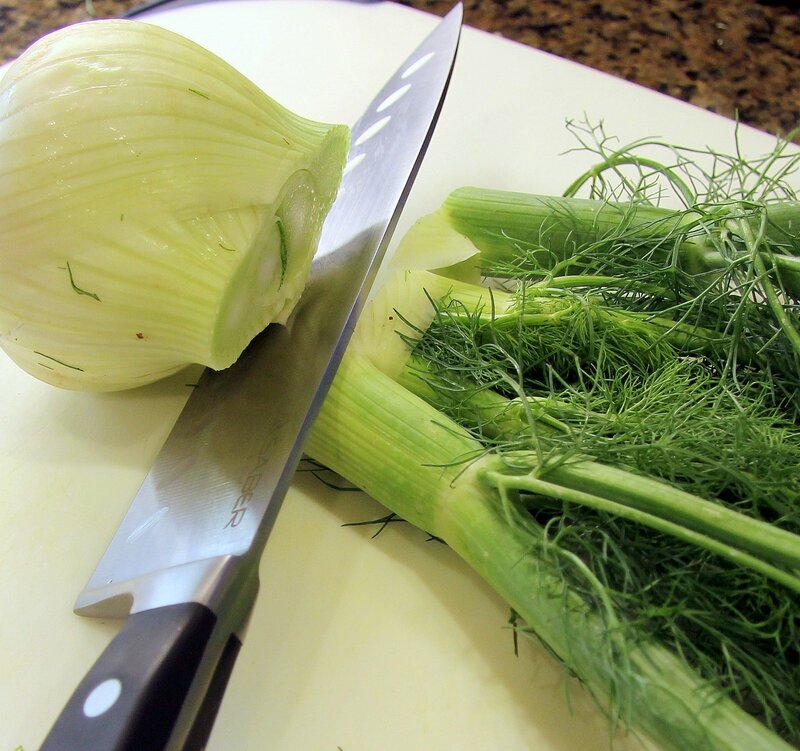 When slicing the fennel bulb for a salad, you want it as thin as possible or it can be a little tough. They aren’t very expensive, you can usually find one for less than twenty dollars. 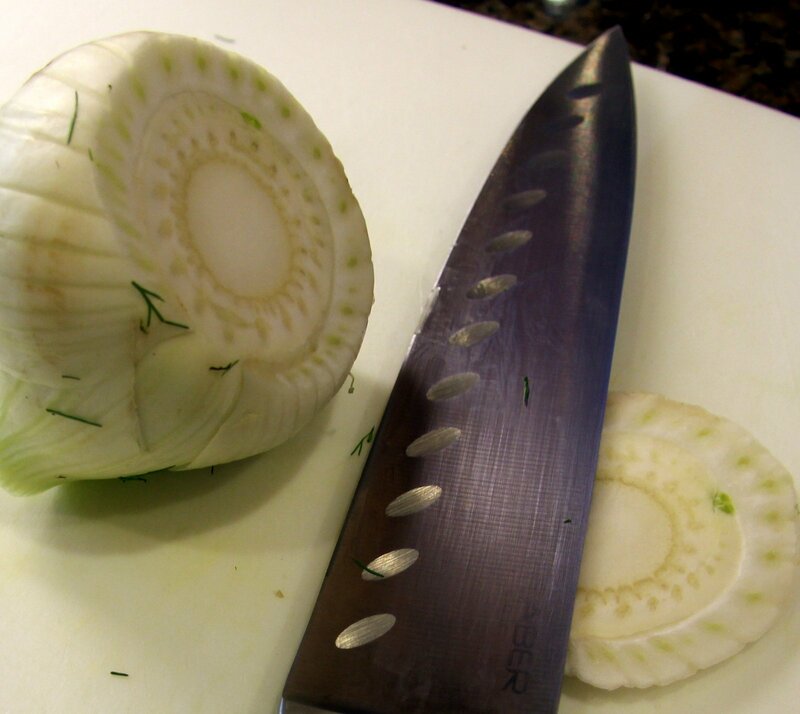 Remove the stalks, fronds and base of the core (on the bottom). 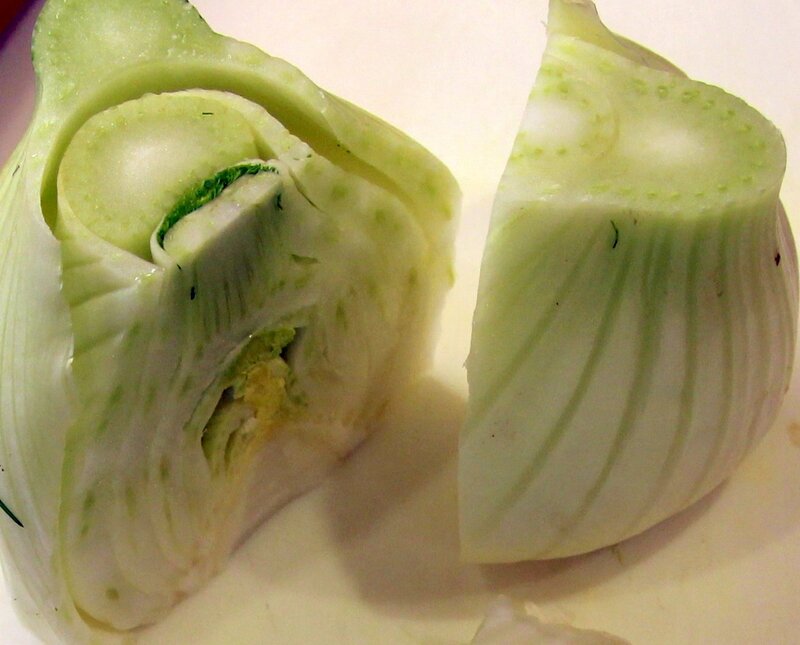 Cut away any discolored areas on the outer bulb. 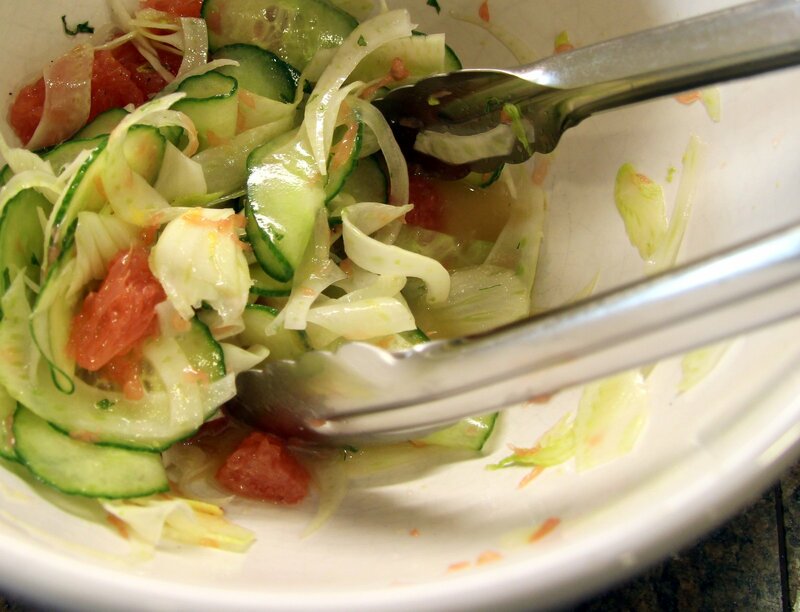 Slice thin with mandoline slicer and place in medium size mixing or salad bowl. 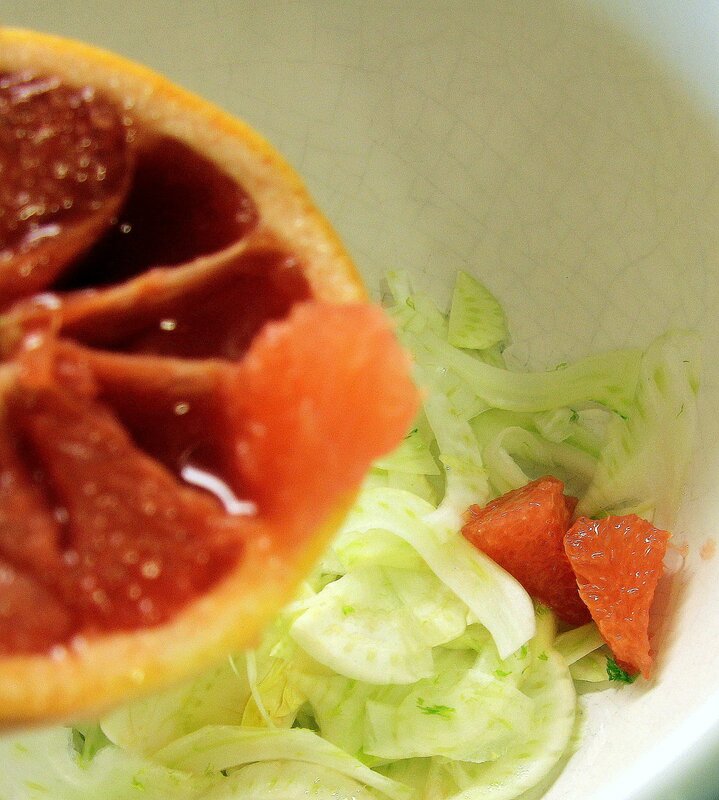 Cut grapefruit in half and cut out segments. 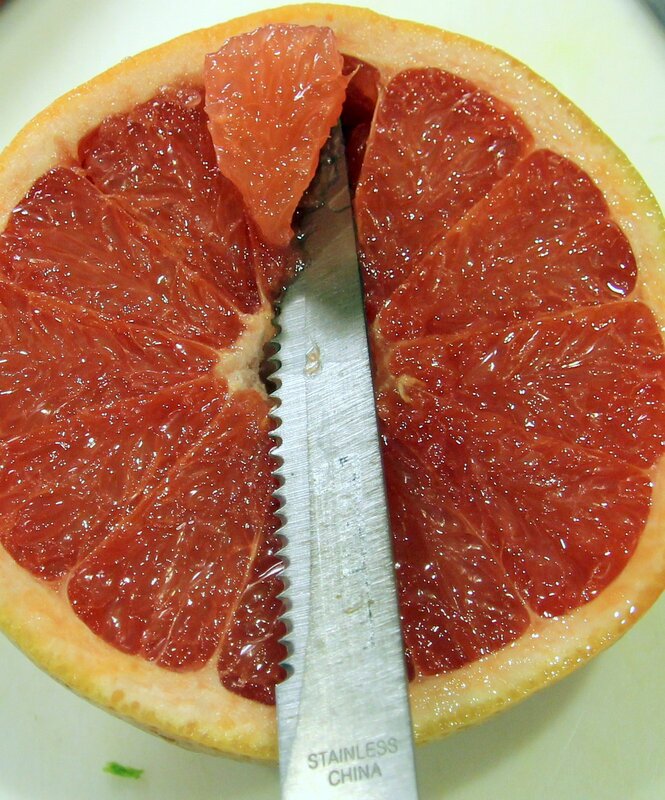 I use a serrated steak knife (I have a grapefruit knife but can’t be bothered to find it) to cut the flesh away from bitter pith. Takes some patience but it’s worth it. 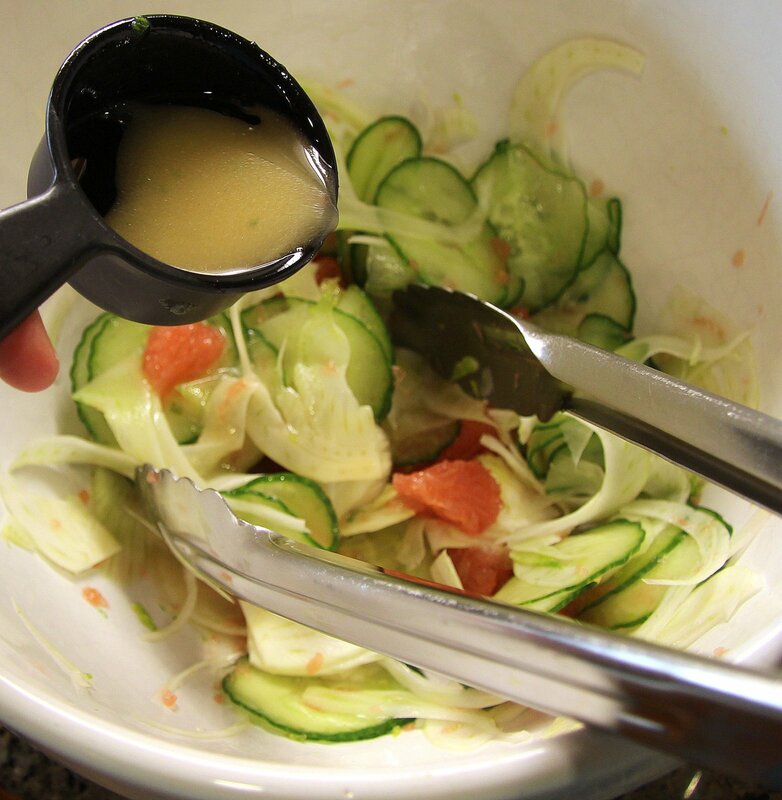 Add grapefruit segments to the bowl, carefully reserving the juice for the dressing. 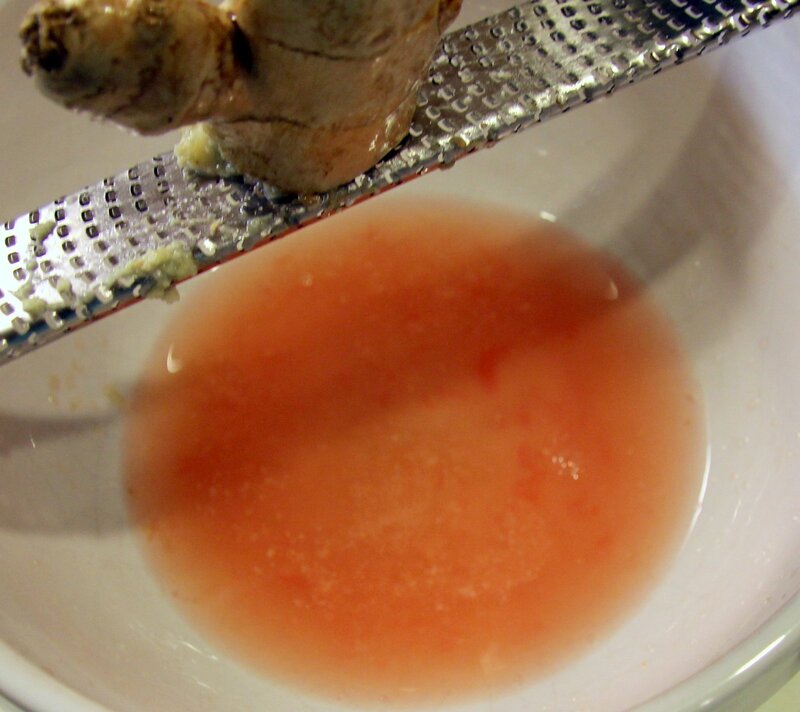 Squeeze juice in a separate bowl and set aside. 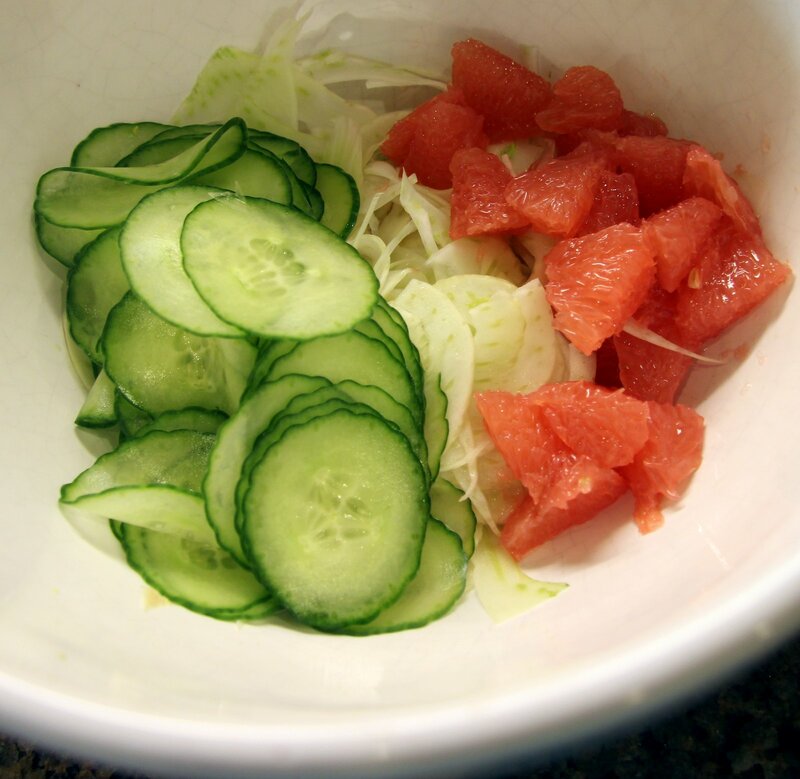 Slice cucumber very thin with mandoline slicer and add to fennel and grapefruit. 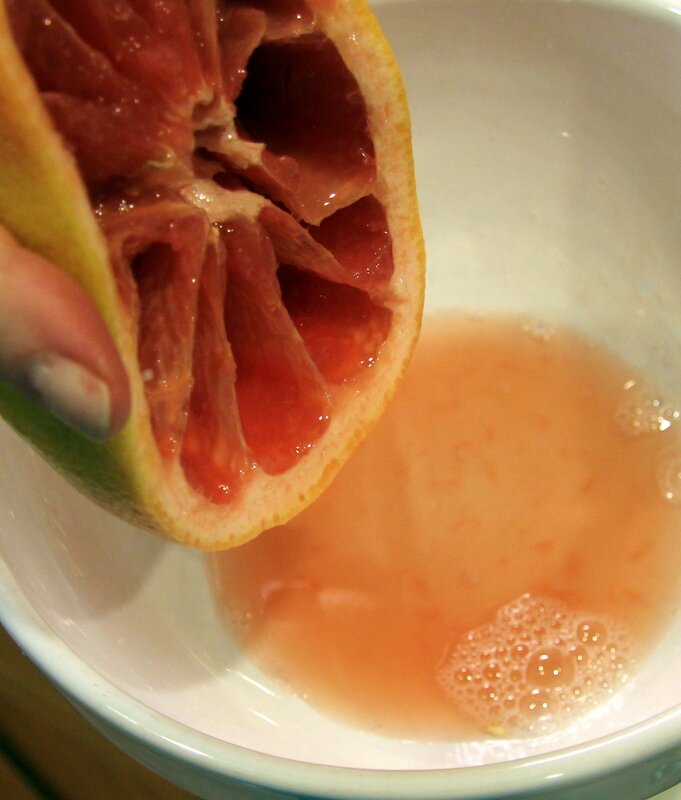 Add grated ginger to reserved grapefruit juice. Slice mint, chiffonade style (long thin strips) and add it to the dressing along with lemon juice, zest, salt and pepper. 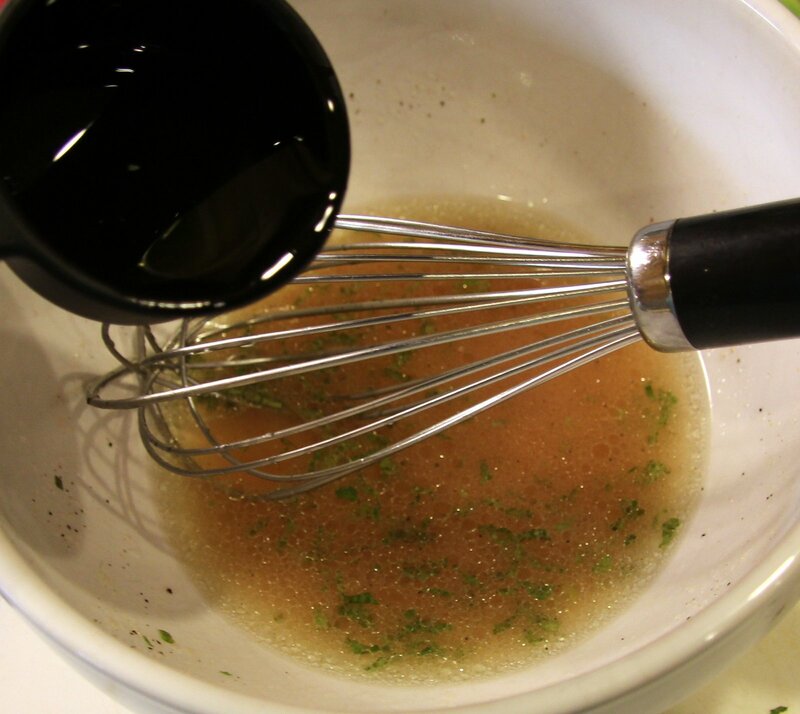 Taste before adding oil, keeping in mind the oil will mellow out the flavors. Slowly add grape seed oil, whisking briskly until it thickens a bit. Dress salad lightly, refrigerate left over dressing. 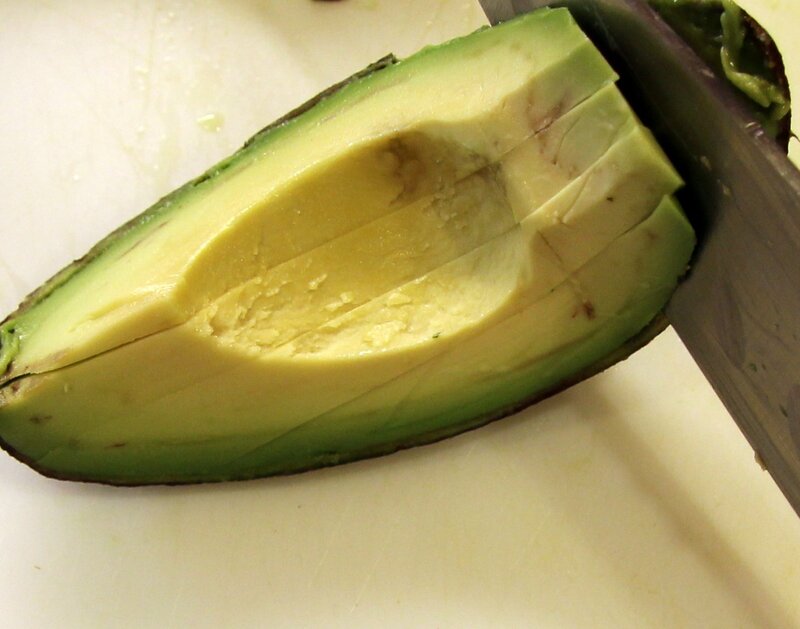 Cut avocado in quarters, then slice each quarter in about 4 slices. 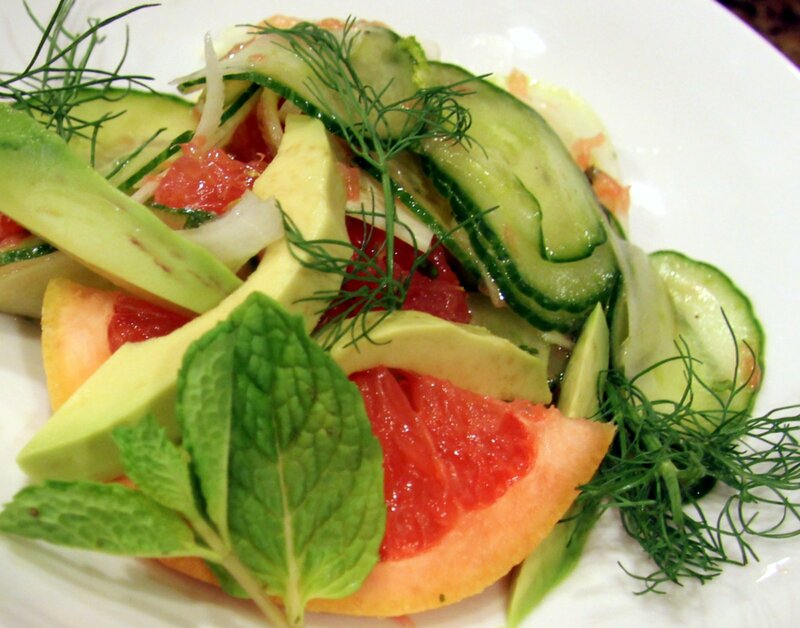 Plate individual salads and garnish with avocado, fennel fronds and fresh mint.